January in New York is tough, its always cold and depending on your timing, you may have a winter storm which just makes things more exciting. Of course this January came through with flying colors. 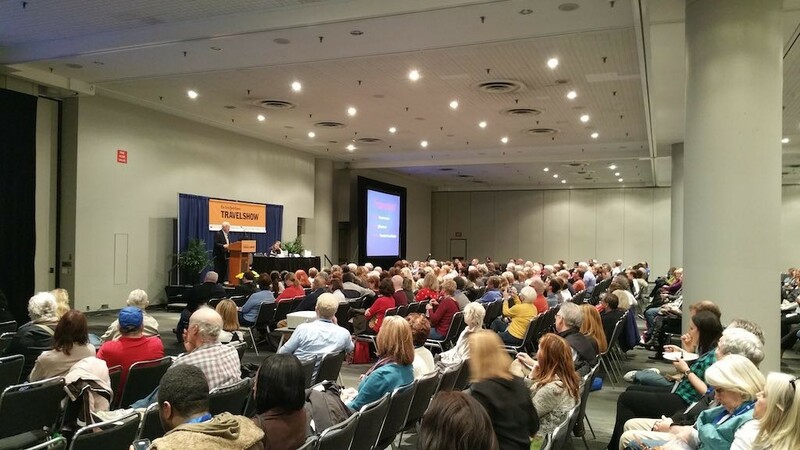 But its the time of year when the New York Times Travel Show occurs at the Jacob Javitts Center. That does not dampen spirits at all as there are over 200 potential partners under one roof for you to sample. Plus there are travel sessions abound that will increase your knowledge of our industry. 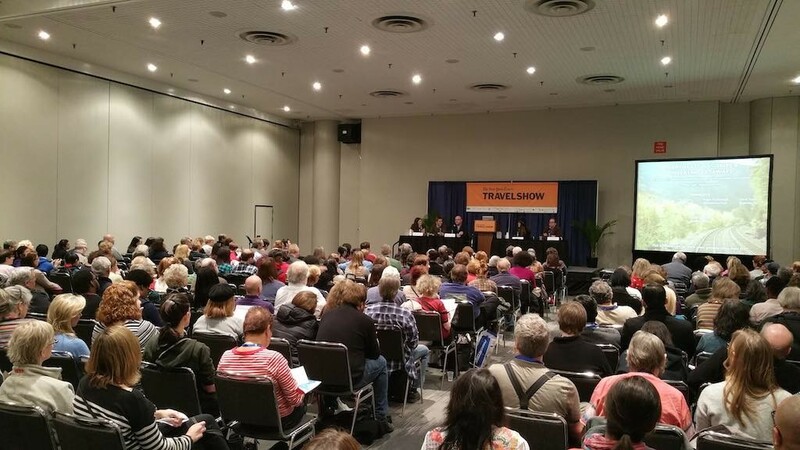 Heavy hitters in the industry attend this show including, JohnnyJet, Paula Froelich from Yahoo Travel, Arthur Frommer and his daughter Pauline Frommer, Lee Abbamonte, Peter Greenberg and a host of other travel bloggers. So its a treasure trove. I hope its on your list for next year. My best part of this show is the Caribbean Round Table, where the partners from different countries come to your table and educate you on their countries. It’s like visiting the Caribbean in 45 minutes. Nothing I’ve done beats this experience. 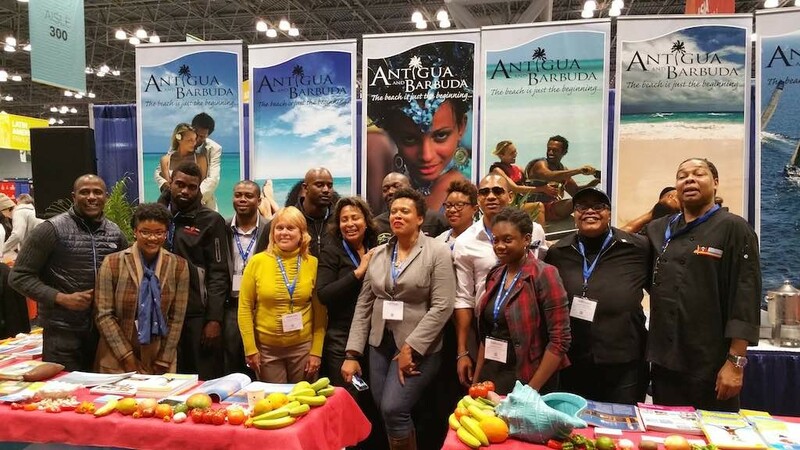 I had representatives from St. Lucia, Puerto Rico, The Bahamas, Cayman Islands to name a few. Africa, Asia, The Caribbean, Europe, North America, South America, I think the entire world had a representation. 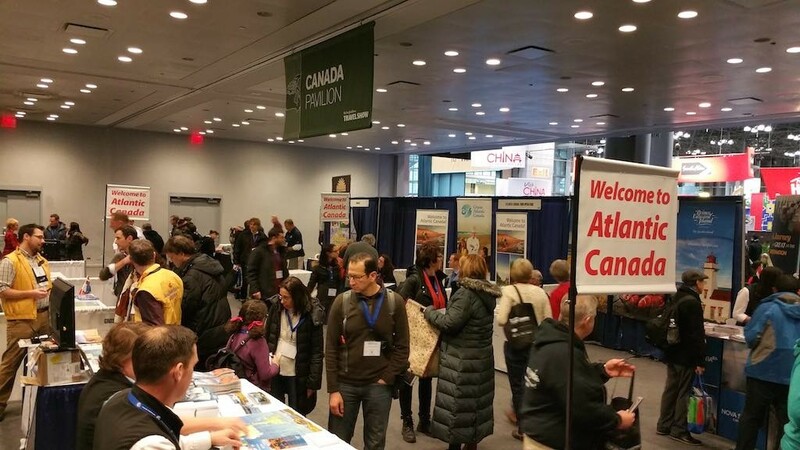 It’s not as big as say World Travel Market in London or even ITB Berlin, but it packs its own punch. I came away with quite a bit of knowledge as well and can now act as a resource for you in more areas. For 2015, river cruising seems to be the biggest item; this was big in 2014, but is getting bigger. I even sat in on a session with LeBoat from Europe who allows you to rent a boat and go boating down some local rivers. A very neat and pretty inexpensive concept based on what you are getting; really good value for your money. Normal cruises are not to be left out as well. 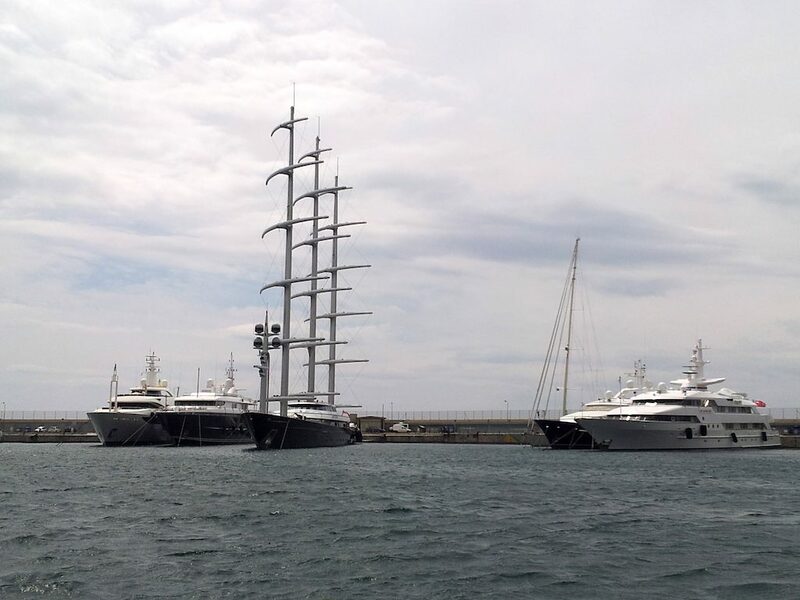 Cruise lines such as Carnival, Celebrity, MSC and Windstar were all represented. Most of the Caribbean islands were represented with their usual fare of surf, sand and sunshine. Which based on the northeast weather is very much needed. Of course Cuba was talked about a lot. But if you’re from the U.S., you can’t go just yet. Hang in there. I actually made a good contact so I’ll give you more information as I know more. It was good to see Atlantic City there again with their DO AC campaign. They’ve taken quite a beating since Katrina, but they keep on going. I even got a chance to meet Miss America 2015, Kira Kazantsev, who is actually Miss New York, so she was happy to be back in her home state. They really want people to know that despite the bad news, Atlantic City is still open and things are well. They have a number of acts performing as well as casino renovations continuing and some commercial and residential improvements coming online. Even Gordon Ramsay is opening a new restaurant at Caesars this year. So things are looking up. 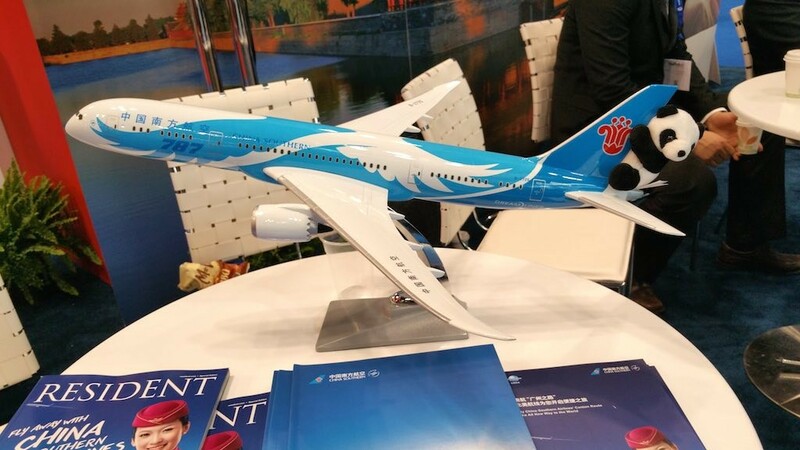 Perhaps the best find was a number of airlines that serve the New York area making a showing; such as Air Berlin, Air Malta, China Airlines, China Southern, Etihad (got to walk The Residence again) and Turkish Airlines. It was great to talk with them and get to understand their goals. Did a few Instagrams and tweets as well. Michael Hodson on working with bloggers. He later asked Veronica from Gypsy Nesters (who is getting ready to publish their first book) and Stephen from Walks of New York/Italy/Turkey to join and answer questions. Adrien Glover, deputy digital editor, Travel+Leisure; Johnny Jet, from JohnnyJet.com and Paula Froelich, editor in chief, Yahoo Travel did a panel on the power of influence. Lauren Matison, Paul Brady, David Farley, Megan McDonough and Brendan Spiegel on the topic of NY Weekend Getaways. The topics were quite varied and the audience loved the information. It was also good to see fellow travel bloggers and catch up as well. This is always a good thing. Had a chance to catch up with Harvey, Annita, Matt, Johnny Jet, Matt, Turner and vlogger Brian to name a few. So if you’re in the neighborhood next year, plan on attending. The networking was fantastic and the learning was indeed worth braving the elements for the three days. 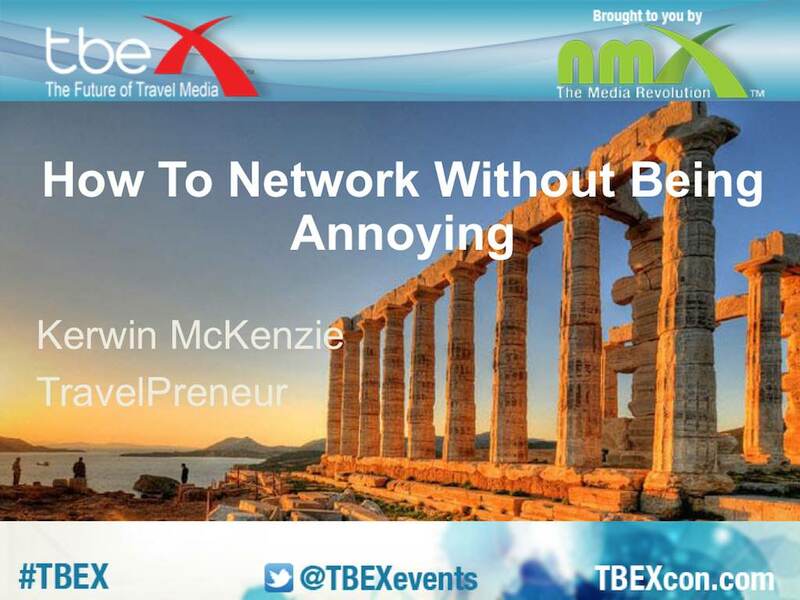 Thank you for attending my talk at TBEX Athens. I certainly hope you enjoyed it and have now met a few more people than you imagined you would when you first decided to attend. Cherish these relationships and nurture them so they will grow. Do not under any circumstances abuse them. The new people you’ve met have entrusted you and you should honor that trust. In case you missed the presentation or wanted to listen to it again, it will be available soon from this page. So please check back from time to time. Please leave a comment below and let me know what you thought of the session and also if you have any tips of your own or any funny networking stores. My mother gave me the gift of gab, my dad gave me the gift of listening; thank you Mom and Dad. We don’t all have the gift of gab and are good listeners though, but we all have a gift. Look inwards and find that gift and use it to help others. What does that have to do with networking you are perhaps asking? Well, I’ve met a ton of people at conferences and at the cocktail parties as I talk a lot, but I also listen. This helps to break the ice and build relationships. But I’ll tell you, one place that relationships are built even more is at the pre- and post-conference tours/trips. 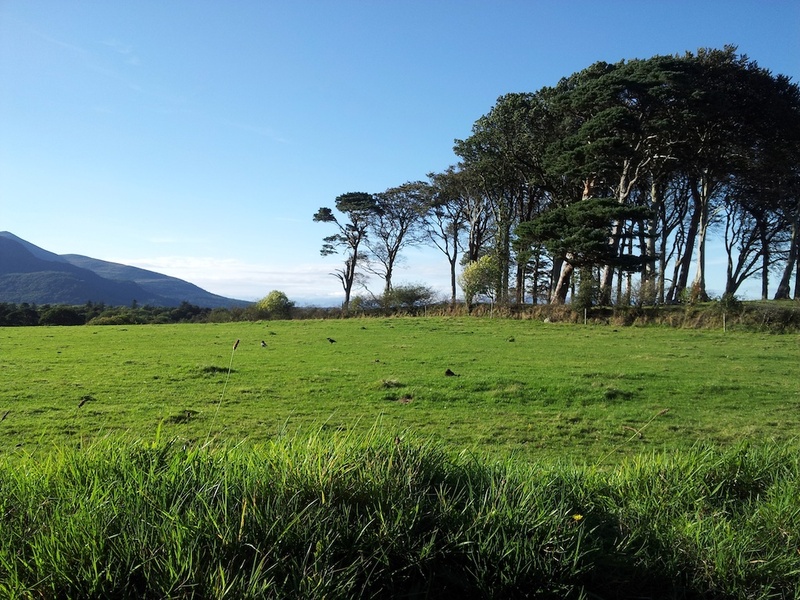 I remember one trip in Dublin when we toured the Wild Atlantic Way Southwest. We all started not knowing each other much, but at the end, we knew each other better and now had a new perspective and respect on what makes each other tick and most importantly, we learned a tremendous amount from each other. I danced with a broom; long story :-). Just ask Bare Feet with Mickela Mallozzi. I even think she has a video :-). On that trip, I also learned how to take better Instagram photos by listening to and watching how the masters Katja, Kym, Laurence and Zach works. Note: I’m still learning so be nice when you view my Instagram account :-). I connected a little better with Cacinda from Points and Travel.com and really got to know here better on another trip to Athens earlier this year. She makes luxury travel easy and not so costly by using loyalty points. I’ve followed, (not creepily, you know on social media :-)) the people who were on that trip and I have since been on other trips with at least two of them. I’ve also supported and followed them on social media and they’ve done the same. I think in Toronto on the bike trip, I rode with my laptop in hand so I could keep my battery charged, so I was dubbed the computer geek, but it was all fun. I’ve been on a few trips (Ireland and Athens) with Laurence N from Finding The Universe and also did his and Daniel’s from Canvas of Light photo session in Dublin. Here’s a video on how to photograph a fountain from the pair. 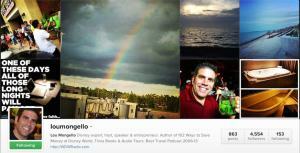 I now follow them both and continue to learn from their photographic works. I still have fun with Daniel as he’s not a fan of using the iPad for photos, which I was doing in Dublin (so I ran out of batteries, what’s a blogger to do? :)). But you learn this from casual interactions and that is what the pre- and post- sessions offer. So enough examples, you should get the point by now. Let me be clear though, you are not going to get along with everyone as that is just how it is. Life would be so dull if this was the case; don’t you think? But you can still be civil and professional :-). The idea is that you get to understand how others think and whether or not you can make a friend and/or partnership with that person. Be sincere, genuine, helpful and respectful. Now in the future when you come across an opportunity and you’ve met someone with that skill set, you know exactly whom to refer. For me, this is a very good feeling. How about you? I can thank my grandmother for making me a giver without expectations. So always think about how you can help your fellow blogger, the rest will work itself out. One thing too is to talk to the person(s) who are holding the tours and the owners of the establishment you meet along the tours. Listen first as you will hear what issues they are having, then think how you can help them solve it. Ensure you get their contact details so if nothing else, you can send them a thank you note after the trip. I remember a vendor in Ireland, he just wanted to fix something on Facebook. I helped him out and he was a happy camper. Sometimes that is all it takes. So Look, Listen Help. 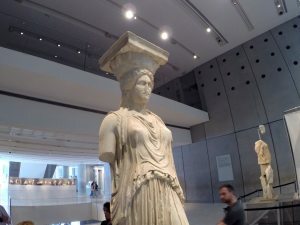 I hope you are signed up for a few trips at TBEX Athens and other upcoming conferences. I’m speaking about Networking in Athens on Friday, October 24 at high noon, so please come visit and say hello if you see me in the hallways or on a trip :-). I’m excited to be able to see some of you on a trip and get to know you more. What have you found in your experiences? Please leave a comment below. So its all set in stone now. 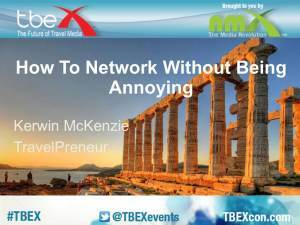 I’m due to speak at TBEX Athens on networking. My friends have always said I could talk to a flea, so I guess that’s a compliment. I was also that kid in school who could not stop talking in class; I’m better now, honest :-). Over the years, I’ve met many people; some have blossomed into great friendships, others not so much. But that’s networking, you don’t always relate to everyone you meet. On Friday, October 24, 2014 at noon, I will focus on you. My talk will provide techniques and tips geared to help you learn how to network without becoming annoying and becoming frustrated. The session will draw from personal experiences as well as observations from life and attending previous conferences. Come prepared to interact with and meet new people. If you’re scared to introduce yourself, you must attend. If you’ve introduced yourself, but can’t hold the conversation, you must attend. If you’re just curious, you definitely must attend. In case you want to practice what you’ve learnt, check out this post about continuing the networking in the pre- and post- TBEX events. See you there. Learn More about TBEX Athens and Register. Will you be there? Leave a comment below and let me know. I just got back from Cancun, Mexico where I spoke on “Getting Started With Facebook Ads And Getting Results.” It was a great experience and I was also able to attend some of the sessions, met new bloggers/potential partners, caught up with old friends, visited some of the local sites and enjoyed the facilities of the Moon Palace Resort. The presentation is available on now Slideshare. I also did some videos on how to get your facebook Ads setup. Check it out (registration required, but there’s no charge). It was great to meet “old” friends and certainly good to meet new ones. I’m always amazed that I see social media messages after conferences from people I know saying they were at the conference and I never saw them. 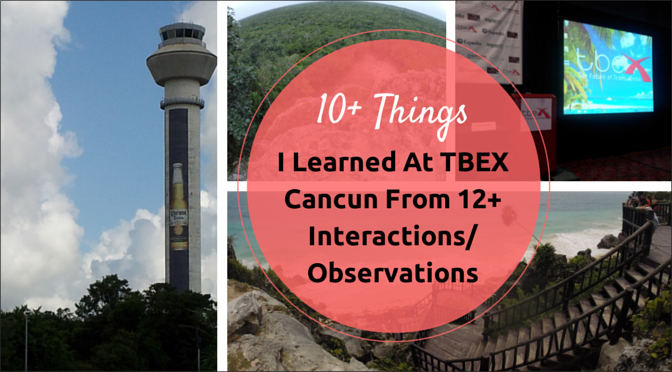 Now that I’ve left the Cancun area, I wanted to share my reflections on what I’ve learnt from this conference as I prepare to head to TBEX Athens where I’ll speak about “How To Network Without Becoming Annoying.” I hope to see you in Athens. Get A Publicist – I finally met Lee Abbamonte; I thought he was the most laid back guy I’ve ever met until later that week I met Louis Cole; see number 2 below. He and I have the visit every country mantra in common; except he’s already done it by the time he was 21. I’m still getting there. Lee did the keynote with Sherry Ott on Saturday morning. They were both interviewed by Paula Froelich from Yahoo Travel. The interview was really well done, funny and educational. One thing that Lee said that struck a chord with me (there were many from that talk) was that he said “the best thing he ever done was to hire a Publicist.” I can’t stop thinking about that since I heard it. So I’m going to investigate this. I mean, I meet a lot of people, but I find that its getting difficult to really investigate opportunities properly. I believe in hiring the right people for the right tasks and hiring a Publicist seems to be the right thing to do. I can’t believe that I’ve not thought about this before. This is why I go to conferences and you should too. The learning aspect is simply incredible. FunForLouis – I’m not sure how many of you are into video blogging. I do know a few bloggers who use video in their blogging though. However, Louis Cole from FunForLouis is a bit different. By the time you read this he should be at 1,000,000+ YouTube subscribers. I was able to hang out with him and three other video bloggers (Alex & Mark [VagaBrothers] and Nadine from heyNadine) for three days and watch him work which included him having a local meetup. He’s charismatic, charming, friendly, genuine and fun. What you see in his daily vlog about his travel adventures is what you see in person and he works hard to make it work. He taught me to keep working hard at my craft and collaborate more with my peers so we can help each other to get our message out. I’ve also learned from watching his videos that I can share more than I currently share except in videos. I currently have a YouTube channel, but my videos are not as good as they should be.You can look at his YouTube channel to see some footage from the TBEX conference as a matter of fact. Let me know if you see what I see. If you are not doing videos, I highly recommend starting as we are in travel and people love to live vicariously through us. Photos just scratch the surface. Thanks Louis. All You Can Eat Resorts – So, Cancun is full of these places. Years ago I stayed at the Fiesta American Condesa and it was fantastic. 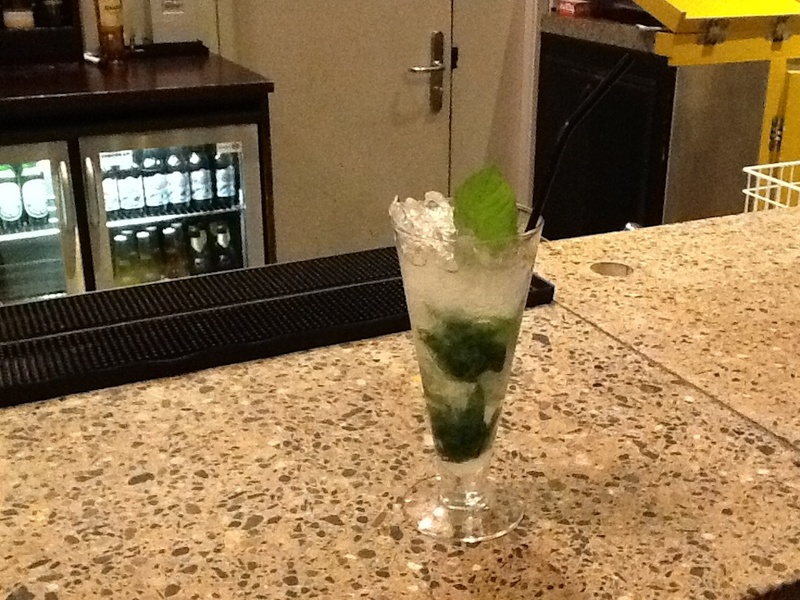 This time I stayed at the Moon Palace Resort. This place is just simply incredible. There’s one price and you eat all, just like it says. No hassles, no holding back. It’s truly the place where you can just go and hide. Except that they have property-wide Internet access that actually works. The mini-bar is really a bar as it has top shelf liquor in the normal size bottles and each day the attendant comes by to refill it. I had to tell him no thank you as I’d not touched anything when he showed up the second day I was there. 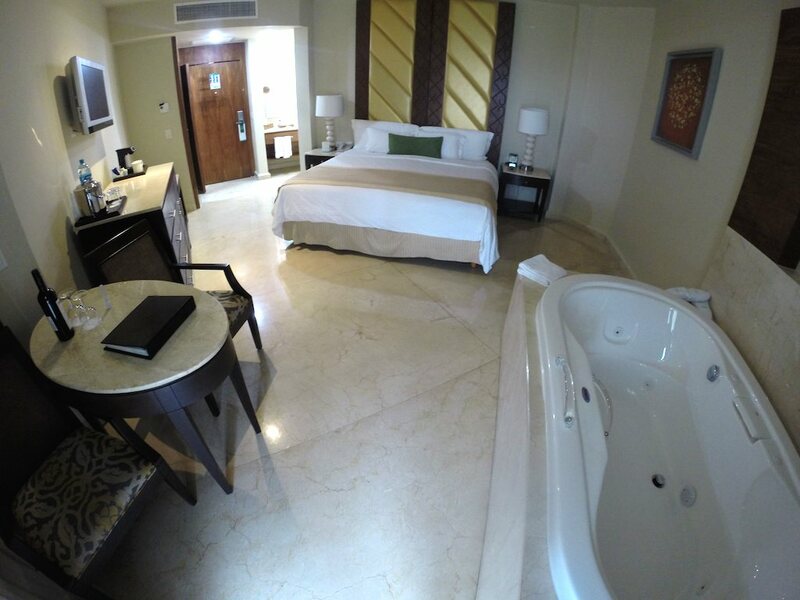 And to top it off, there’s a jacuzzi in your room. Yes, seriously! My only drawback was checking out as it was a bit slow. They sent me a survey and I included the comments there so they can improve that aspect of the stay. So what did I learn here? Ensure that you deliver quality content to your customers at all time. Always give them their money’s worth and more. This breeds repeat customers that are always happy. I’m Not A Big Fan of Whale Sharks, But My Friends Are – The Cancun Visitors Board gave a group of seven of us an opportunity to swim with the whale sharks. I’m not a fan of water sports, so I opted not to go. No I’m not scared, but its just not my thing. I’ll swim, the occasional snorkel and hang out on the beach, but I’m not an ocean lover. The others went and had a blast though. 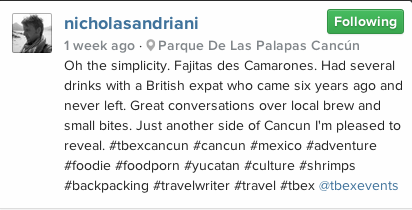 You can see several videos in the #CanYouCancun twitter and instagram hashtag feeds. When you travel, you should know your limitations and don’t push it. It’s Cool To Advertise A Beer On Your Control Tower – I’m an airline geek so I like to see the different Control Towers at the airports worldwide. They are truly works of art. 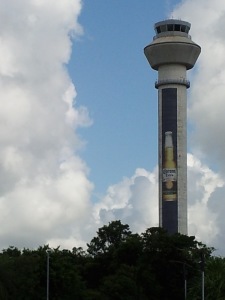 The Cancun airport (CUN) has a large Corona beer bottle painted on it. You can see this thing from pretty far away. Sometimes you just have to do something really big and bold. So watch out for it coming soon. Think of what you can do on a much larger scale than you are doing it right now to propel your blog forward. Social Blade – This is a an App and also a Web site that gives you follower statistics about your Youtube, twitch and Instagram accounts. You can actually do anyone’s account so you can keep an eye on your competition as well. The App is free and can be found here. Louis told me about this app; thanks. The learning here is to be curious and talk to your fellow bloggers if you see them using a cool tool, just ask about it. Cooperatize – I was sitting at lunch with another blogger, Robin Ewers (met him in Rotterdam at TBU) and Al from Cooperatize came over, introduced himself (that’s how it’s done at TBEX) and talked to us about this monetization concept. I’d read about it before and was thinking of signing up. Also other bloggers had talked about it on the Facebook Groups and said they liked it as it worked and they got paid. You basically sign up, enter your data and wait to be matched up with a partner that wants to work with you. Then you evaluate the opportunity to see if its what you want and voila. They even have a referral program so you get paid when you refer others. Check it out and evaluate it to see if its for you. Lesson here is to be receptive and respectful when approached. It’s just the polite thing to do. A New App Called Been – While driving to Coba, Alex, one half of the brotherly duo VagaBrothers (Mark is the other half) showed me this App on his mobile phone. It allows you to enter the countries you’ve visited and it then displays the percentage of the world you’ve visited. Since one of my goals is to visit every country in the world; 109 so far, I’m intrigued. If this is your thing or you are just curious, Check it out! I downloaded it and its simple and way cool. I’ll recommend it to my geeky airline audience whom I know will love it. You Can Get Certified As A Cooking Blogger – So who knew this was the case? I also run a cooking blog, CookingWithKerwin.com where I talk about cooking Jamaican food. Eventually there will be cooking videos, etc. 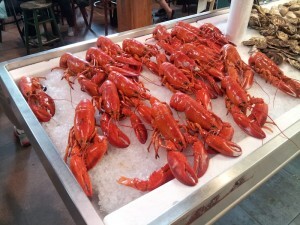 In my travels, I’ve noticed that there are also tons of food bloggers out there. I’ve never heard talk about a CCTP until I sat in on Diana Laskaris’ talk. 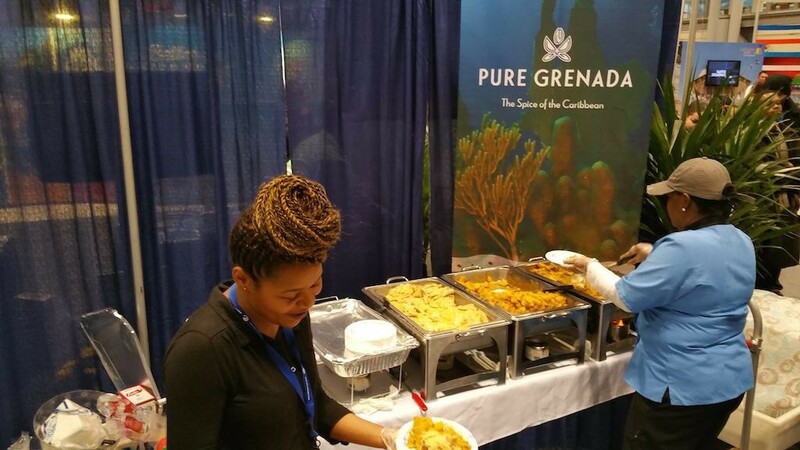 The World Food Travel Organization came up with a certification called “Certified Culinary Travel Professional.” To get your certification, its necessary to take a paid online course, then you get certified and now have street creds. Check out the course details. How To Get More Traffic To My Blog – Ian Cleary from RazorSocial is one smart dude when it comes to social media tools. At the last TBEX (Dublin) his talk was up against mine so I could not attend. This time that was not the case so I wandered over to his full house talk and I learned more than I need to about traffic building. 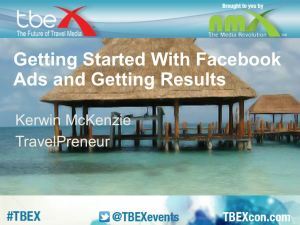 Watch the TBEX emails for links to Ian’s 15 tips to build traffic to your blog. In the meantime, check his latest blog post with even more tips. Ensure you sign up for his newsletter as well so you don’t miss out. It was in his newsletter that I learned about Canva.com. With Canva.com, you can quickly create an image without much expertise. This helps me whenever I need something done quicker than I can outsource it. Long form Instagram Posts – At one of the events, I said hello to a young man from Kansas City called Nicholas Andriani. I love to say hello to just random people at conferences, as this is what you do. We had a great conversation and I found out that he’s an author with excellent knowledge of Israel and the Middle East. So we connected socially and I started following his Instagram stream. This is where it gets good. Nicholas gets on average 10% engagement from his Instagram posts! one even had 16%. But his audience is 1,166 followers. That’s insane! I’ve not seen that much engagement even for others who have a ton of followers. So the next day I saw him and we talked about it. He thinks its due to the length of his posts. He tells a mini story in the posts and of course adds the appropriate hashtags. Genius. His fans are also raving and clearly loves his content. Check out his stream on Instagram and follow him so you can learn the craft. I’m going to look into being more informative in my posts and see what gives. 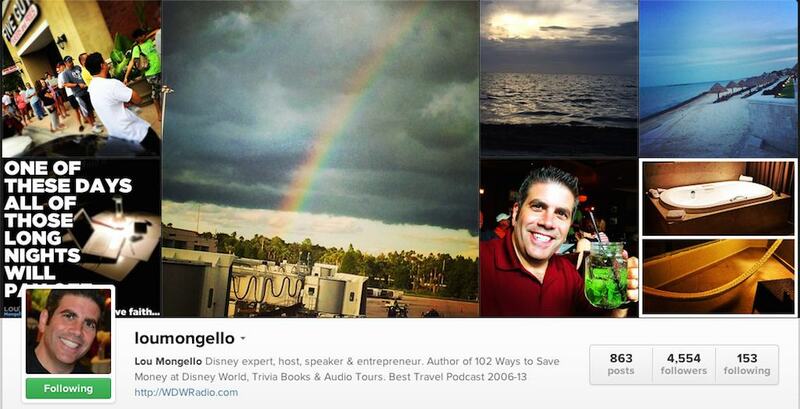 Get Your Podcast Going – I had the fortune of sitting next to Lou Mongello on the bus back from one of the TBEX parties. He’s the Disney expert and does a podcast on the subject. He’s huge! I’d seen Lou speak in Vegas at NMX this year or was it last year? It all blends together; but had not had a chance to connect with him. Thanks to the long bus rides at TBEX, we chatted about podcasting, how he got started with Disney and he gave me some pointers to get started with my podcasting. I actually used to podcast ages ago when it was first launched with a software called Odeo, which was founded by twitter co-founder Jack Dorsey. I’ve already setup the podcast template compliments of tips from Pat Flynn’s “How To Podcast Guide” and I do something similar currently as I answer questions from my audience using YouTube videos. The podcast will be called Ask Kerwin where I answer travel-related questions for my audience. After my talk with Lou, I told my audience via my weekly newsletter to expect a podcast, so now I’m committed. Thanks for the convo and words of encouragement Lou. So always talk to people you meet, sit next to or pass in the hallway. At the end of the day, TBEX is really about networking. Find A Newbie – At every conference there’s a newbie; well several. I never seek them out, but I usually find them. 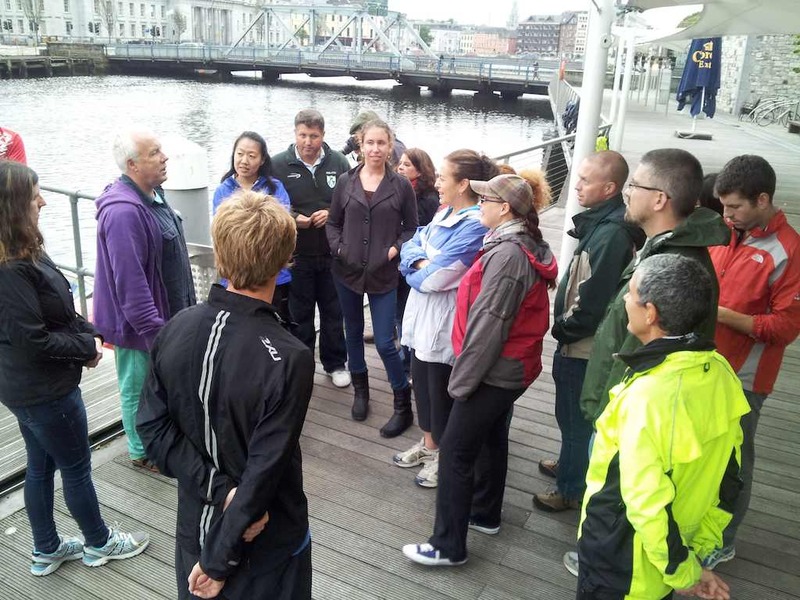 In Dublin, it was Eugene from Traverse in Converse. In Cancun, it was Jessica Medina. She was writing a book about how we travel differently and wanted to talk to a few bloggers to see if they were interested in being interviewed. We spoke and I introduced her to as many people as I could whom I know would also introduce her to others. Conferences are scary especially when you are there for the first time and meet or want to meet your online idol. So if you see a newbie, stretch your handout, say hello and guide them. I Have A Lot More To Offer – I ran into Jen Leo at the registration desk. 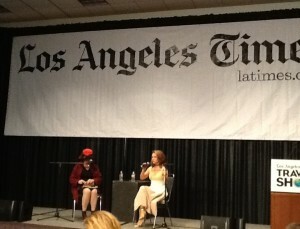 I’d previously met her at the LA Times Travel Show, said hello, but had not really interacted much. An interaction online here and there over time was about it. I follow her on twitter and enjoy her App reviews with the LA Times as I’m an App geek. 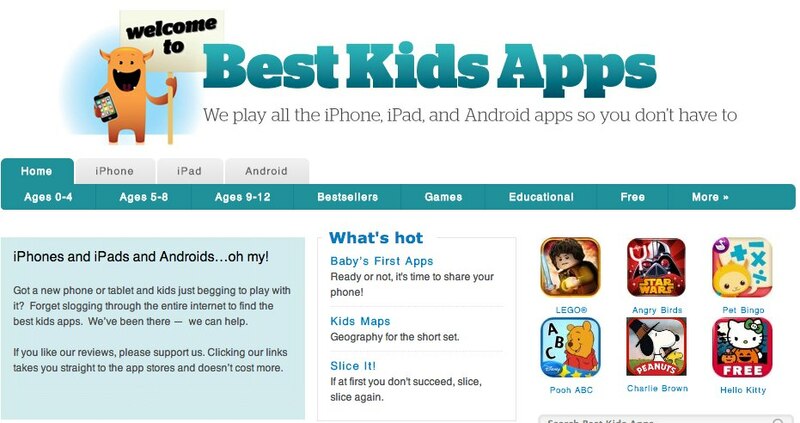 She does a lot of travel-related stuff, a podcast with Gary Arndt and Chris Christensen, in addition to a new enough site, BestKidsApps.com. Just Google her and you will see what I mean. After meeting her at the registration desk in the Moon Palace Arena, we headed over to the main lobby, sat down and really had a conversation. It was very inspirational to get to know her and what she is all about a little more. We shared stories, had a drink, just relaxed and enjoyed the moment. Yes, its not always chaos at conferences. Thanks Jen. So what did I learn here? Well, you don’t always make a connection the first time you meet someone. Take your time, it comes eventually and naturally. So, get your act together, attend a conference that is related to your niche and also attend one that is not in your niche (its how you learn other things). Get out there and meet other bloggers, share your craft, study them, its the only way you will move forward. Give, give and then give some more. If you were at TBEX Cancun, what are your thoughts? If you were not, I want to hear your thoughts too. Please leave a comment below. 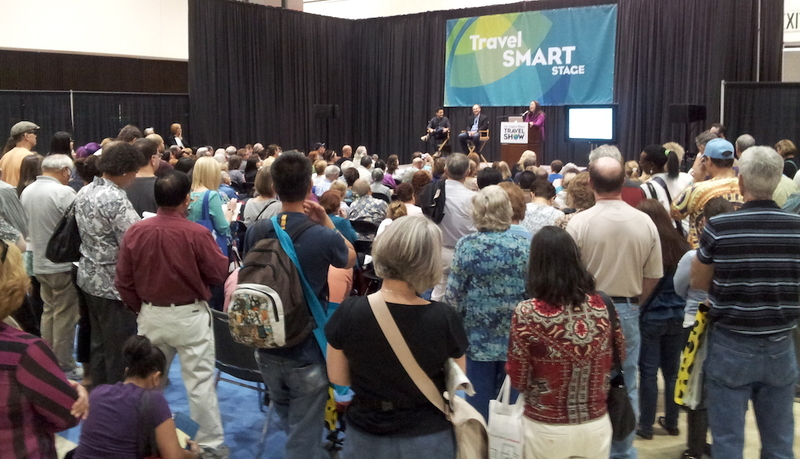 I constantly see travel bloggers in the online forums and in person asking “how is so and so convention or show, should I go and is it worth it?” So that has inspired me to write this post after my visit to The Los Angeles Times Travel Show. Here are seven reasons why I attended The LA Times Travel Show. 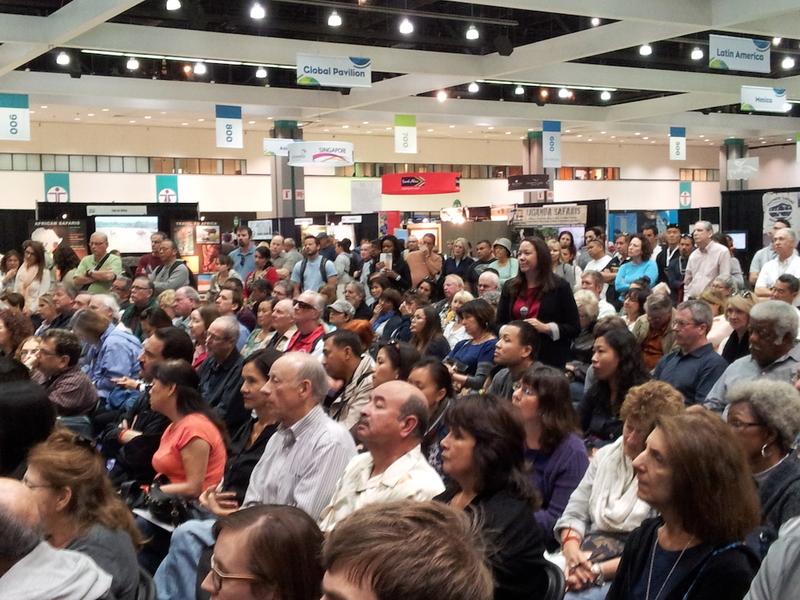 Curious – I never know whom I may meet or what new technology I will learn about at this show. As it turns out, Alyssa Milano of “Who’s The Boss” fame was giving a talk on her involvement in UNICEF. I’ve wanted to do some stuff with them, so it was great to listen to her experiences. Market Research – Yup, this is our play ground. 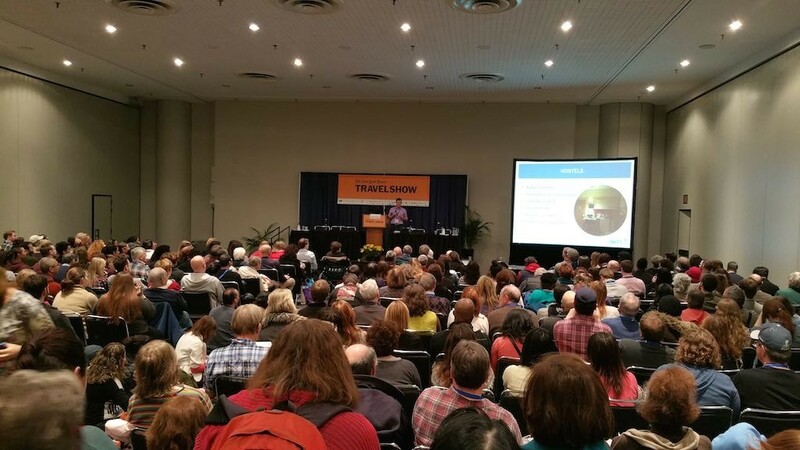 If you are a travel blogger, travel conferences is a great place to do research. You get to meet real travelers, people who are clueless about travel and those who are experts. I love research so this is my playground. I watch what people do, which booths are crowded. I also watched people as they took notes as this tells you what they are interested in. I gotta tell you; they all want to save money so are looking for ways to do so. 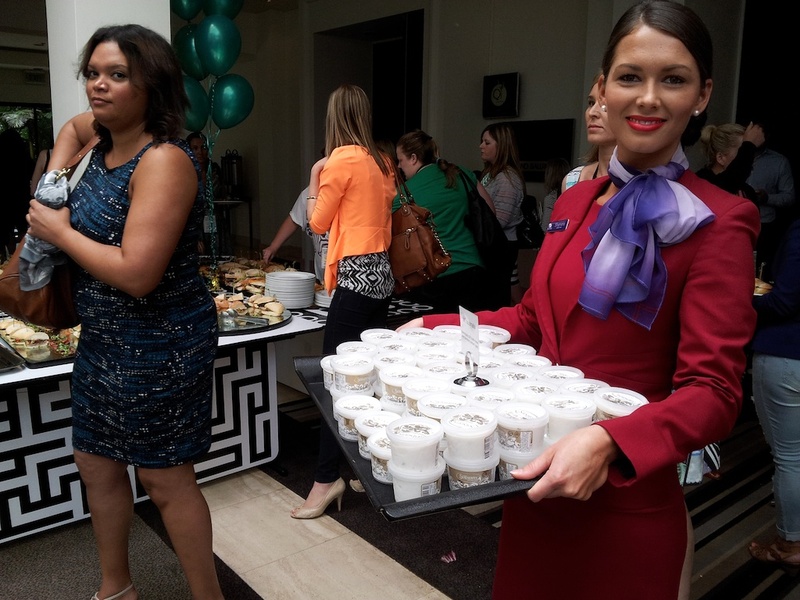 Networking – I met old acquaintances and a few new ones at this year’s event. I got a chance to press the flesh with Jen Leo from the LA Times Apps for the Year and This Week in Travel, Johnny Jet, Eric Rosen from The Points Guy. Plus representatives from The Parking Spot, Fiji Airways, Singapore Airlines, Turkish Airlines, Guam Tourist Board just to name a few. 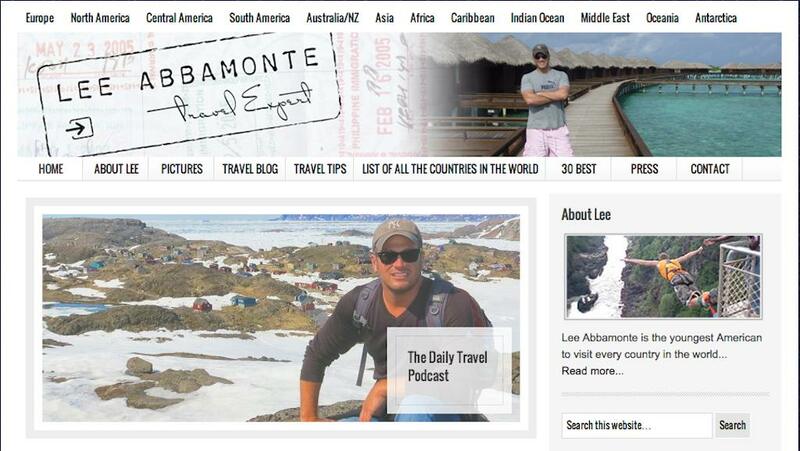 I also talked with travel experts on Africa, Nepal, and Turkey. As you can see the networking opportunity was tremendous. And local fellow travel blogger Arnette from RTW Girl stopped by to say hello and enjoyed a bit of the conference as well. I could not do all this sitting at home, wherever that is :-). And neither can you. 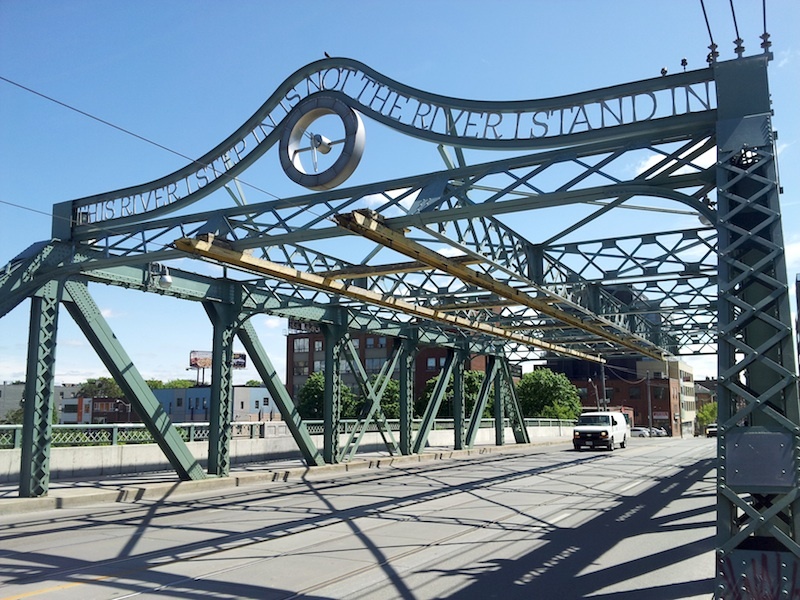 Education – I learned so much about new destination, new technology and new travel services. Arnette and I spoke to Ari guy who books award travel for his customers at AwardMagic.com and does a fine job that he makes a living from it. So you can see that the show is like going to school except on the weekend. 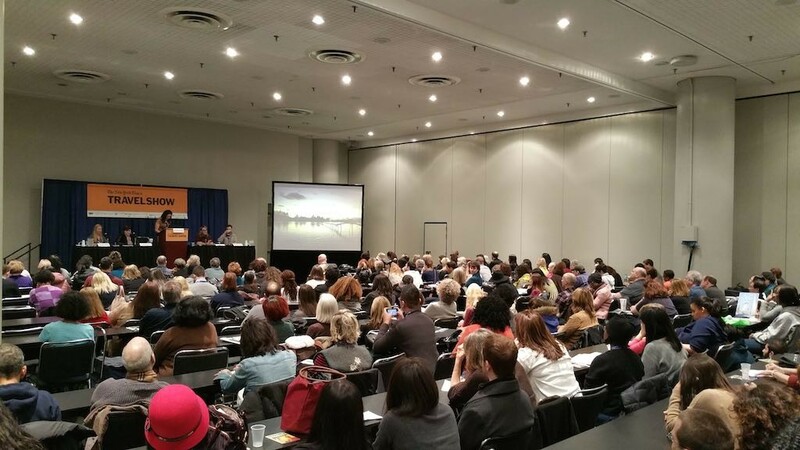 Trends – It’s always good to listen to the speakers as they talk about the hottest destinations and where is trending for travelers. Looks like Asia is the winner this year as its cheap and has fare sales often. And just like at CES, looks like Wellness Travel is the next crazy thing out there. You get to hear people like Arthur Frommer speak, which is always a thrill. He’s still going strong after all these years. Now they also have a Trade Day; Friday, but I did not make it out there for that. 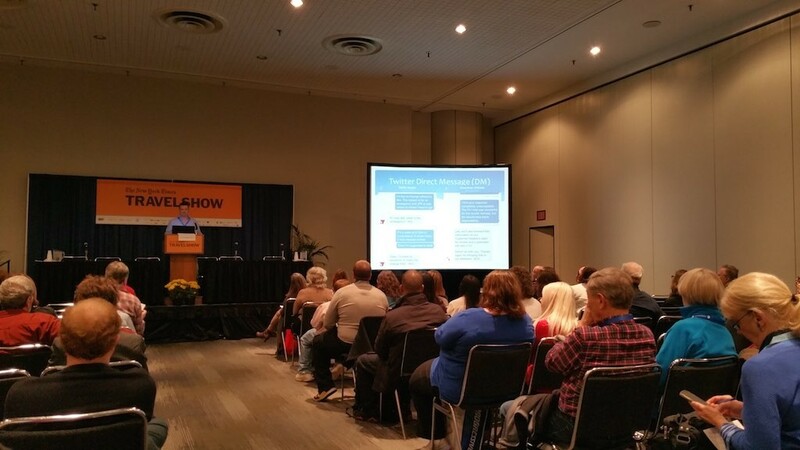 Michael Hodson of Go, See, Write, spoke on PTBA’s behalf about how to work with bloggers. Innovations – Sometimes you see how something is done and it triggers ideas for product creation and product differentiation. 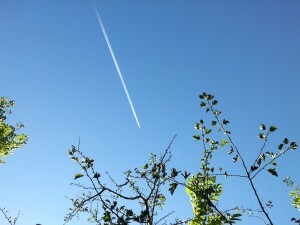 Content – You get so much content for your blogs as you learn about new destinations. At this show Jennifer Leo did her annual Travel App Review so I learned about some new apps I can try out. Plus I learned a bit more about Turkey and was able to record the presentation. 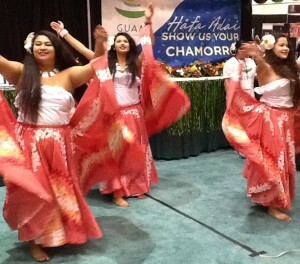 In addition, I recorded some dance moves from the folks from Guam. More unique content, further differentiating my brand from the crowd. Travel – Duh! :-). It’s an excuse to visit Los Angeles. I did not do much in that area as I’ve been to LA many times as I have family living out here. 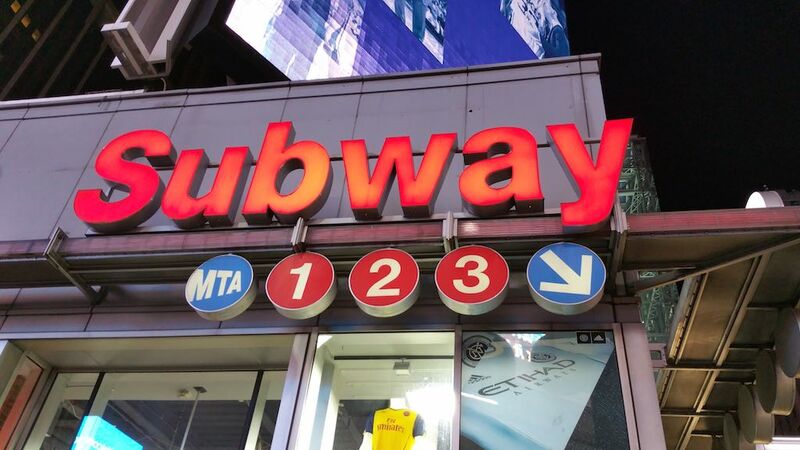 But I did take the public transportation extensively, particularly the train. So now I have a better knowledge of how it works. We do have a list of conferences here for your review. If you’ve attended conferences, do you think its worth it? Please leave a comment below. 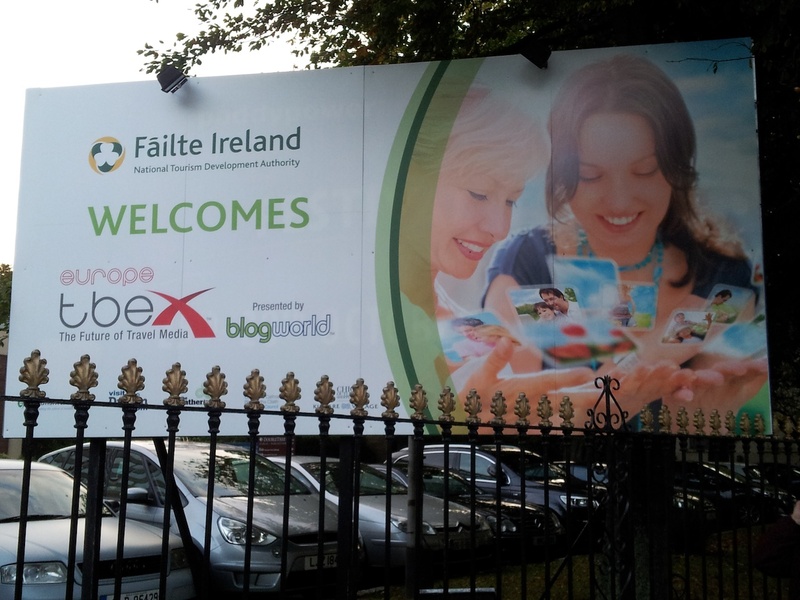 I just got back from TBEX Dublin 2013 and in a word; WOW! I’m so tired now, but it was worth it. Conferences are fun, but its a lot of work. It’s work that pays off though. Here’s what I thought of the conference. 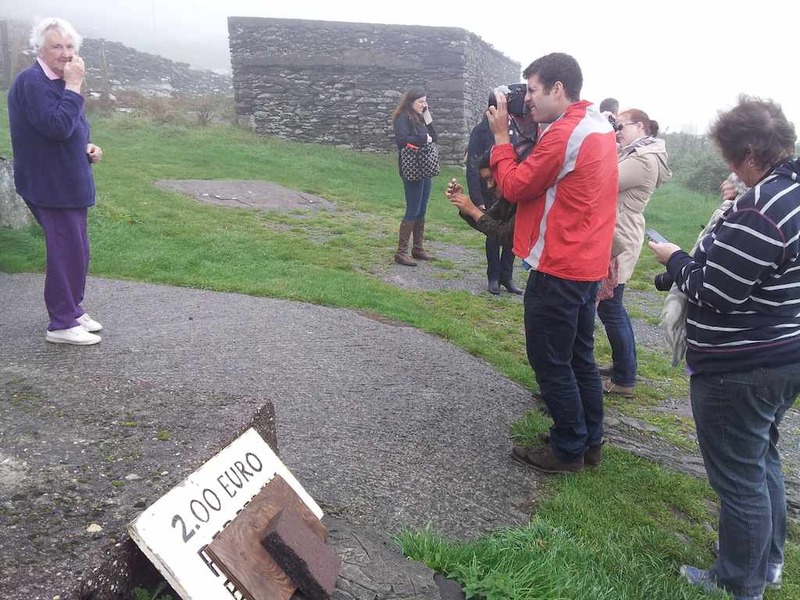 I arrived early on September 27 as there were a few pre-TBEX tours offered and I was not sure if I was going to get one of them; they were starting on September 28. 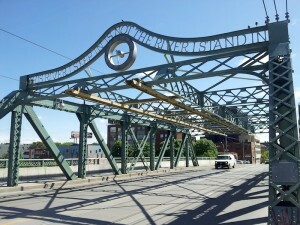 As it turns out, I did not, but I got a post-TBEX tour so I was psyched. Either way I would have been happy. 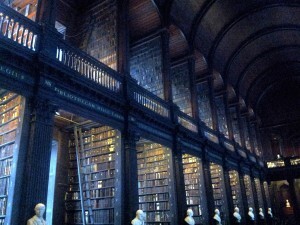 I spent the pre-TBEX days seeing Dublin and took a short trip up to Drogheda (pronounced Drawda). I also learned about hurling as the big match was on Saturday. As a result it was difficult to find a place to stay and at the last minute got the Abigail’s Hostel which is a block away from O’Connell street and the Liffey River. A nice hostel, but I wished they had lockers in the rooms rather than having topaz extra for the ones in the lobby. I also stayed at the Generator Hostel for a few days as well. They are O.K., but they need to get their Wifi act together and breakfast is extra. Other than that, its a cool place to stay. This TBEX was different for me as I was as speaker. Corey Taratuta from Irishfireside.com and I spoke on How To Build and Market Your Email List. I was and still am very stoked about that. I had never met Corey before TBEX, but we worked very well together getting everything together. 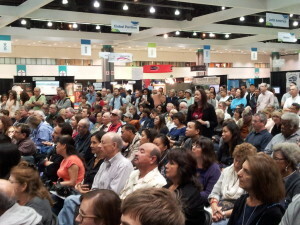 I hope we delivered great information to help the attendees in their businesses. If you have an idea for a talk, I strongly encourage you to submit it when its open. Don’t be dismayed if you get turned down; I was turned down a few times, but that is how life works. Don’t give up. Of course TBEX is not TBEX without parties and there were many. Travel Massive, the official TBEX Opening Party at the Guinness Storehouse, a reception hosted by DoubleTree by Hilton and a Speaker Reception. These availed me the possibilities of meeting tons of people. 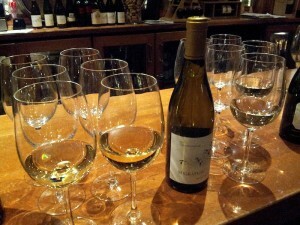 Although they are parties, I worked hard at networking and had a few drinks as well. After you’ve been to a few TBEX, you end up with a number of great contacts with whom you eventually become friends with, so it was great to see some of them again in Dublin. It was a good time to catch up with them and see how they are doing in their travels. The fun thing is always remembering where we first met. 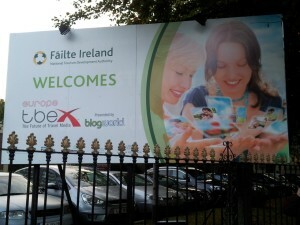 TBEX worked with Failte Ireland and offered some local things to do before and after the conference in Dublin. I was able to do a few of them and totally enjoyed it. 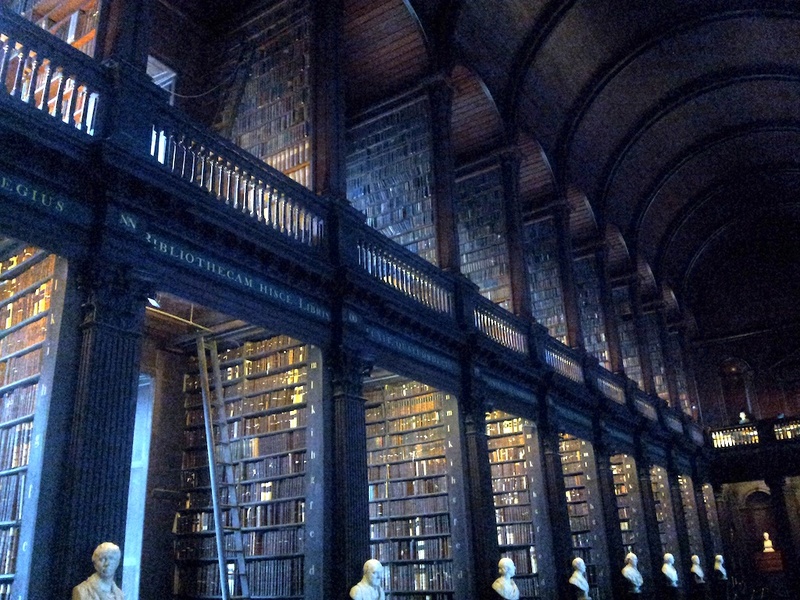 I had always wanted to photograph the Old Library at Trinity College, so i signed up for that tour and was met by the very knowledgeable Anne Marie who led me on my tour; I was the only TBEX person there so it was way cool. Plus she is the lady that took the Obama’s on their tour when they visited a few years back. Immediately after, I rode a Segway from Glide Tours for the first time. Hugh and his tour guide Alex were more than accommodating; thank you! Following that it was time to do the Viking Splash Tours, which surprisingly was entertaining and took me to parts of the city I perhaps would not have ventured. 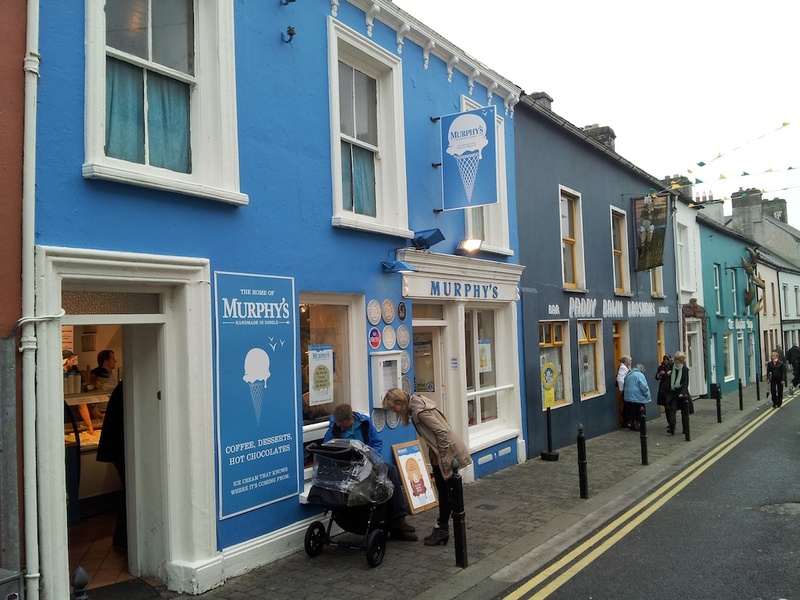 If you see people eating fish and chips near the Christ Church Cathedral, they got it from a famous chips place nearby called Leo Burdock; apparently, its the best in the world. Check it out on your next visit. The Gibson Hotel hosted a few of us at a cocktail making session. 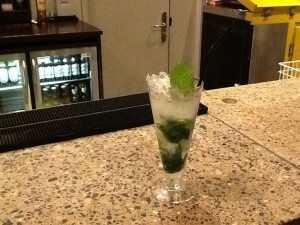 Our bartender, Shawn, was very professional and I even made my first cocktail; a mojito! It was a great evening where a few bloggers had a chance to mingle, learn about each other and get some skillfully-made drinks on the house. 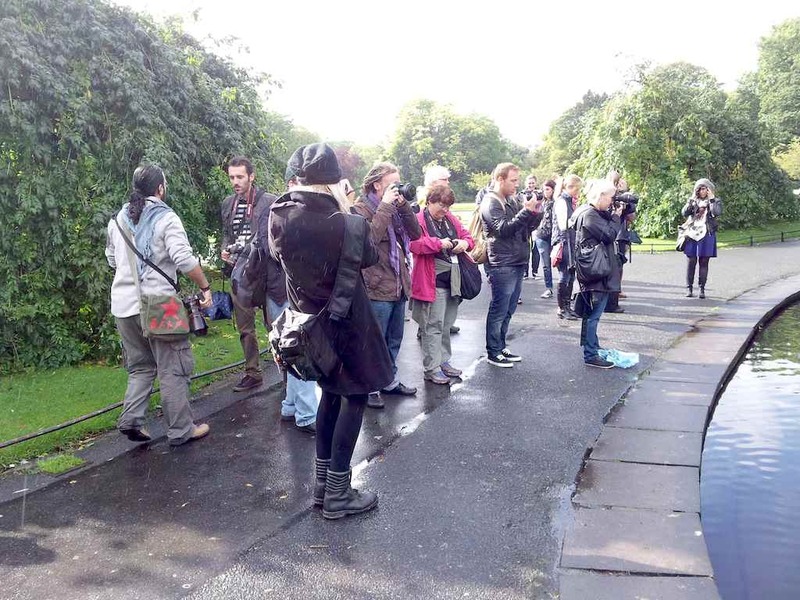 I must say thanks to Laurence and Daniel for putting on the Photo Walk. I met almost twenty other persons there and despite the rainy weather, got some good photos; well I think they are good :-). It was somewhat entertaining as I was the only one who showed up with an iPad. 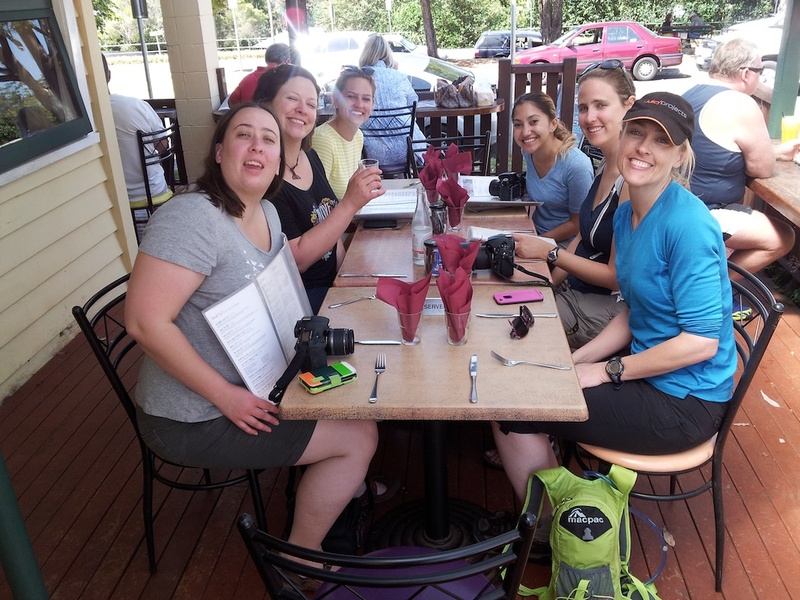 I also caught up with my travel blogger friends about what they’ve been up to while on the walk. One of the best things about this walk is meeting with Lina from Jordan Tourism. 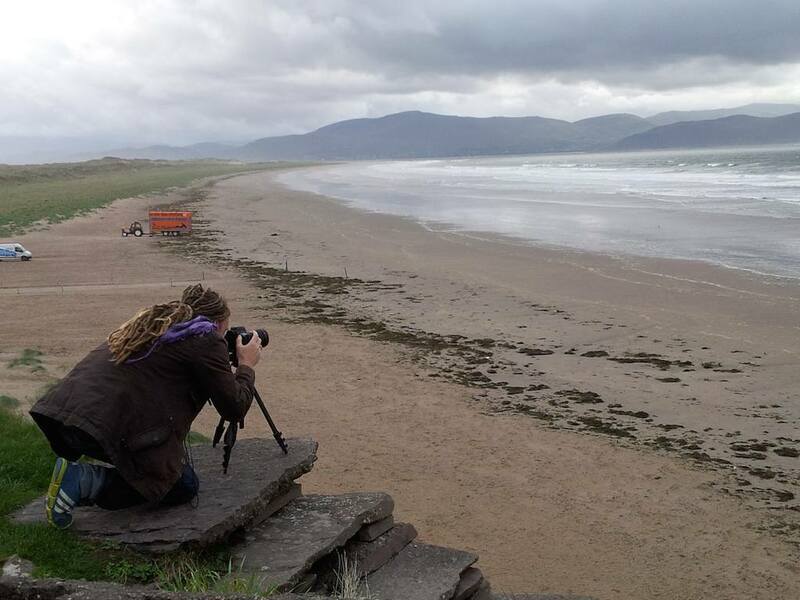 A few of us talked to her about her expectations from travel bloggers; this was invaluable. Oh and I was able to see what kinds of cameras everyone used and get an insight into their photography. Future post coming. There were many great sessions at TBEX this year. I really wanted to check out Ian Cleary’s talk on “21 Tools & Technology Tips to Dramatically Grow Your Following Online,” but we spoke at the same time so that’s not possible. Ian’s talk is on his website though, so you can take a look. I did not attend any of the breakouts after my session as I was talking with a few attendees from my session. There were many great content, so I just picked the ones in which I am the weakest and attended those. Some bloggers teamed up with others and swapped notes. If I find out any information for where the speakers have loaded their content I will advise. In terms of keynotes, there were three and they were all really well done. My favorite though is the closing one done by Dan Noll and Audrey Scott of Uncornered Market. It was great to hear additional insight into their lives having met them about a year or so ago at a conference no less. They even got a standing ovation from some of the attendees which was quite cool. Their talk was inspiring and left us feeling good about what we do and what we should do going forward. Thank you both. Just so you know TBEX has a few power couples, perhaps a story for a future post. 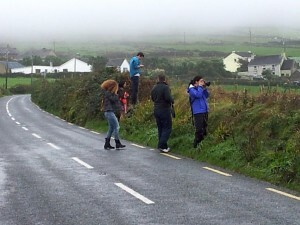 Oh, I can’t close without talking about the post-TBEX three-night trip to the Wild Atlantic Way South West. Search for the hashtag #WAWSouthwest on all the social media sites to find comments, stories and pictures. I have to say this was the best part of TBEX Dublin for me. About 18 of us were together and it was a great way to really get to know other travel bloggers. We really bonded and talked about what worked for us, what does not, what areas we needed help, possible partnerships, etc. It was exciting to hear what each of us were working on and what we’ve done in the past. We stayed in some cool hotels as well; The Malton in Killarney, Dingle Skellig Hotel in Dingle and The Clarion in Cork. 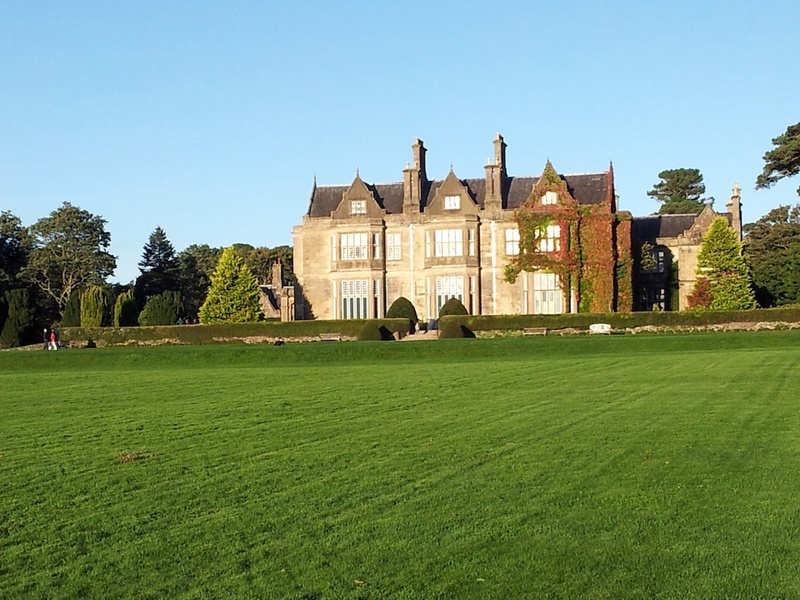 All three properties were excellent and the staff and managers pulled out the stops. Some had chocolate while others had welcome cookies. It was also great to find out what tools we use for the areas in which we are strongest. All that and getting to see the Irish towns and countryside. You’ll see future posts about Ireland soon. Thanks to Shauna from Failte Ireland and Fiona our tour guide and Brandon our bus driver. I tried to get to drive the bus, but to no avail. Perhaps best for us all :-). 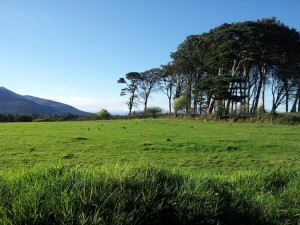 I’ll just say that Ireland has a lot to offer and the green in Ireland is unlike any other green I’ve seen in all my travels. Two comments I heard/overheard from a few attendees were; good sessions were concurrent and the lack of them being recorded meant you had to miss one and the conference being longer than the advertised two days. In the latter they mean that the conference is advertised as Oct. 3/4, but really, it started on 28 Sept. and ended on Oct. 8, since there were pre-TBEX and post-TBEX trips. Having been to a few TBEXs, I knew that and planned accordingly, but I can understand why someone new to TBEX would not understand that their are pre and post trips so plan accordingly. Food for thought for the organizers. My goal for TBEX was to learn a lot, help people I meet and interact with and say hello to as many people as possible; I lost count :-). I spoke to people in bars, restaurants, the hallways, in taxi cabs, in buses, at the attractions, at parties and in meeting rooms. This is how TBEX works. 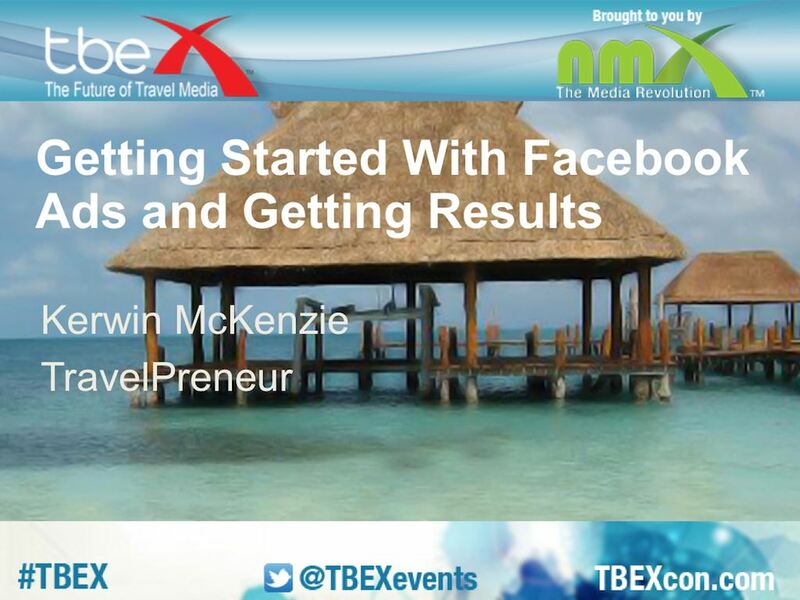 How was your TBEX? What were your favorite talks? How were the events you attended? If you attended my talk what do you think? It will help me to improve in the future, so don’t hesitate to leave a comment. Will you be at the next TBEX? New To Travel Blogging? Then check out my FREE Travel Blogging 101 Course. As a travel blogger, one of the best things you can do is to attend conferences and network with your fellow bloggers and conference speakers. So for my next act, I journeyed to Gold Coast, Australia to attend Darren Rowse’s Problogger Event 2013. I wanted to do the same in Melbourne, Australia last year, but that was not to happen, but instead I enjoyed it virtually and live. 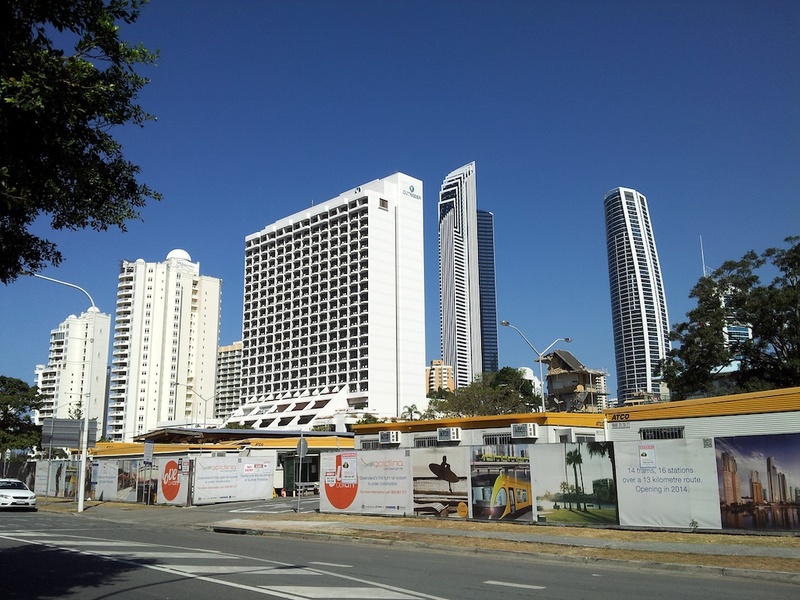 I arrived in Gold Coast two days early, so I could acclimatize myself as well as relax before the event. Darren had an excellent line up of speakers ready to go by the 8:30a kickoff on Friday morn. I was pleasantly surprised that during his keynote he interviewed select bloggers so we could have an insight into what makes them tick. Kudos! This continued each time he had to deliver a session where he was alone on stage. What I really like about this event is that the recordings are available soon after the talks were over (You can have them too). There were a few glitches on the first day, but I did not notice as I was too busy attending the sessions as well as networking. And networking is the main reason by I attended conferences. No other place would I meet the people who speak at the conferences and the attendees. Now its so much easier to communicate with the people you met as they know you. Amy Porterfield killed it with her Facebook session. I have two of her courses on Facebook and Facebook Ads and I learned a ton more just from listening to her. Thank you Amy. Trey Ratcliff was one of the persons Darren talked to in the morning; we have a Math and Computer Science degree in common and we both love Captain Picard, so now we follow each other on twitter. Trey is also a very personable person. I had missed his talk at TBEX Toronto. I enjoyed his keynote the next morning as I loved his presentation style. I’m already thinking of how I can use that in my future talks. I attended a few other sessions on Speaking, Analytics as well as Video Editing. Plus I met a ton of new bloggers as well as someone from Linkshare (Affiliate Marketing) to answer some questions I’ve had for ages. Oh, did I mention there was an awesome party? This gave us another opportunity to interact with each other and get to know each other just a bit more. I always ensured I said hello to everyone I sat next to; it’s only polite to do so. Later that Saturday, we celebrated the birthday of Craig from YTravel.com. It was great to meet he and his wife as well as other bloggers in a social setting. On Sunday, post conference, I was able to hang out with five other bloggers compliments of Darren and the Tourism Queensland folks. They treated us to a day in Queensland, where we rode bicycles compliments of the host hotel QT Gold Coast, had lunch at the Seaport Surf Club, took a jetboat, rode two rides at Warner Brothers Movie World, lunch at the Spice of Life in the mountains then went to the Tamborine Mountain and did the SkyWalk and finally beer and cheese at the MT Gallery. Now I have a ton of content for my blogs. Monday, I slept in and then despite the rain I took the local bus and went back to Sovereign Island as I wanted to get a closer look at the homes we saw on out jetboat trip. Holy wow! As I write this, a storm has moved in and I have a 6a flights. But I’m super happy about coming to Gold Coast for the PB Event. Thanks Darren and team. 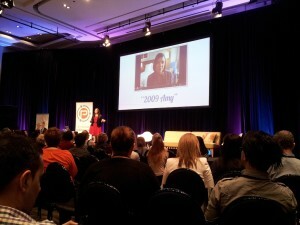 So next time you can make a conference, you should definitely do so as its a treasure trove and is always worth it. 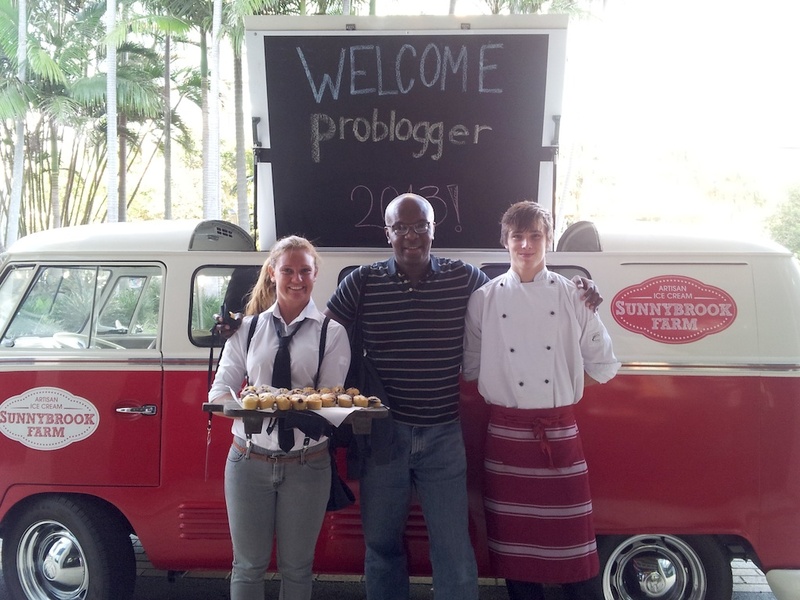 How as your problogger event? 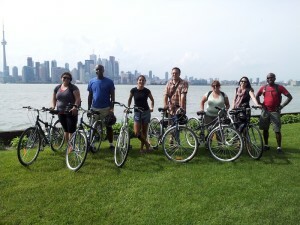 Networking: My Word for TBEX Toronto 2013. How Did You Do? I made my way to Toronto from New York City, NY on Tuesday night after an all day .com)/via Rail train ride through upstate NY and southern Canada. After looking at many places to stay, I had pre-booked a room in the dorms at the University of Toronto’s New College Campus conveniently located on the edge of downtown. 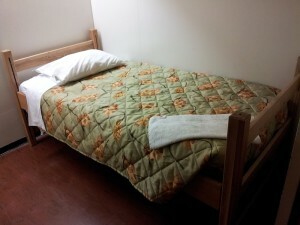 This place is open for rentals from May 4 to August 4 when most of the students are away. It’s cheap at 35 CAD/night for a single room and 29 CAD for a shared double with shared washrooms with individual shower and bath units. No, I did not take a bath there. Plus there is a common room (kitchen included) as well as a washer and dryer (1 CAD each). 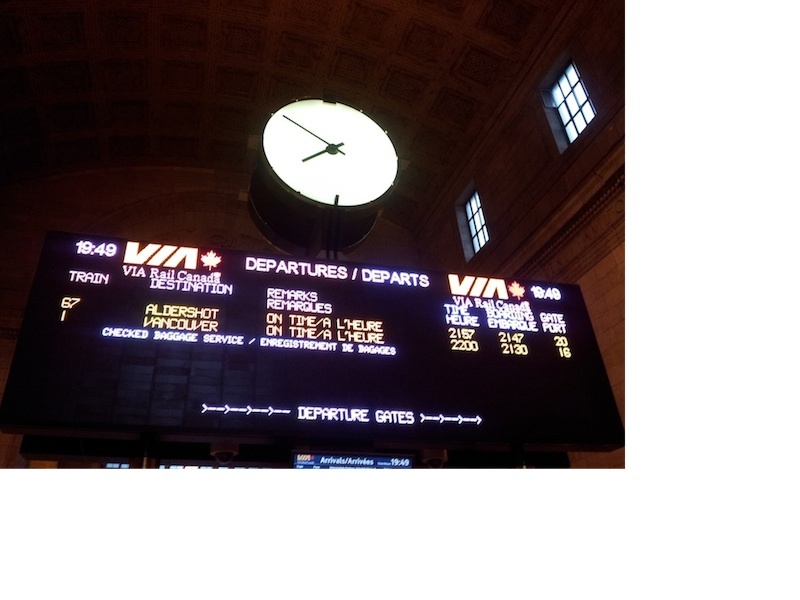 Over the next few days, I had managed to snag a tour of the Ontario Wine Country near Niagara Falls as well as a craft beer tour, a photo walk, a bike tour of Toronto Island and a tour on the 501 Tram down Queen St. All courtesy of Tourism Toronto, so thank you. 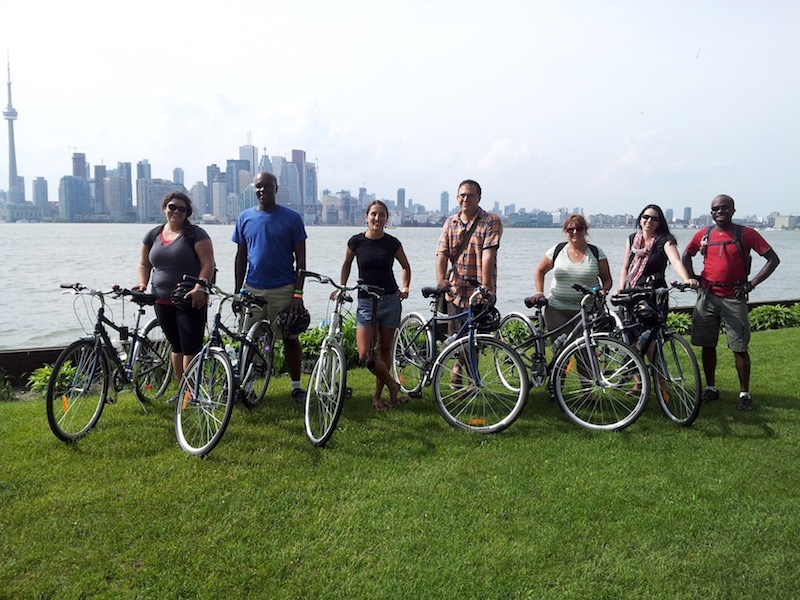 These tours allowed me to get a good flavor or was it flavour of Toronto’s offerings so I can share with my audience and be intelligent when they ask about Toronto/Ontario. I ensured I attended all the parties, well most of them anyways; even the Travel Massive one where myself along with a few others drank beer at a local pub while we waited to get in as we had not RSVPed. It was well worth it as I got a chance to meet more bloggers and industry professionals while trading stories over a glass of something. 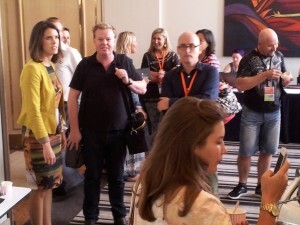 You see TBEX is all about networking; at least for me anyways. You have to sharpen up those skills, say hello to everyone, be polite and respectful and network. Work on that handshake and 30 second answer to “What do you blog about?” Give, give and give some more. And if your friend is speaking, try your best to support them although sometimes this may be really tough. It was great to meet many people from all over the world who blog about all kinds of topics. I challenged everyone I met to tell me why they blogged and what they wanted out of the conference. Most people had an idea, but some did not as it was their first time, so they knew not what to expect. But it was great to hear them try to come up with something though :-). It was equally great, well somewhat more so to meet “old” friends. Some I had just seen a few weeks ago on the other side of the Atlantic at TBU Rotterdam and others whom it had been a while. So TBEX is like a class reunion of sorts at times. By the time I got home to my dorm room on Friday night, my birthday, I knew I’d be late for the keynote on Saturday morning; I was not drunk or anything like that, but I was tired. By now, I’d been going nonstop since Wednesday a.m. Travel Blogging is hard work, but fun rewards, so, its totally worth it. It was 9:26a when I arrived at The Metro Toronto Conference Centre so I just went straight to the exhibits and chatted with the exhibitors that interested me and some of the new ones I’d not seen before. It was great, as I got to spend about 0:45 minutes almost uninterrupted with the folks from google talking about the Flight Explorer as well as the hotel application and where they see themselves in the travel vertical. They have great plans, but are really looking for the masses. This disturbed me as I’m concerned about using some of the tools they acquired from ITA; but we will see what happens. 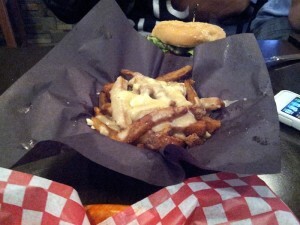 By the time I was done, it was about 12:30p and lunch time. Since it was Saturday and I wanted to see the St. Lawrence Market in action (a local recommendation), I ditched the complimentary lunch (sorry TBEX) and headed there. I’m so glad I did as it was special; future post coming. It was not until 2:30p that I returned to the Convention Centre, just in time for the Dave & Deb Show where they did a recap of the travel blogging business so far, thus providing us with vigor to continue on. Thanks guys for the inspiration. It’s always great to hear you both speak. I skipped the Speed Dating as I did not sign up and I hate just having a few minutes to talk to people about what they are up to and how I can help them get their word out. This is why I took the morning to make acquaintances. Of course it meant missing the sessions, but it was a worthwhile sacrifice. A TBEX Tip is to always say hello to everyone you meet at the parties, in the hallways and/or sit next to at a presentation. You never know who you are interacting with so be professional and cordial. I’ve met great people that way; its the art of networking. Later that night, Expedia threw their big shindig on Centre Island providing us with food, drinks and yet another opportunity to network which I did. They also launched their Expedia View Finder opportunity where they are working with several bloggers to bring different perspective in travel; congrats to all. I spent a good time with Stefan from Rapid Travel Chai and his wife, Tess getting to know them a bit more, then hopped around meeting others. 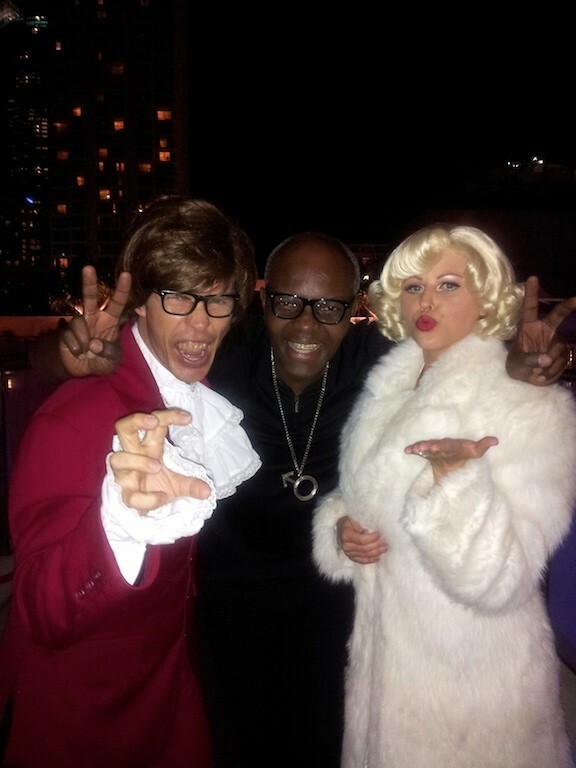 A Fun night! Oh, I had forgotten to download my pictures before coming over, so I was out of room to take additional pictures. Hence I had to delete some old ones and only took a few pictures. I had all my batteries charged though; oh well. 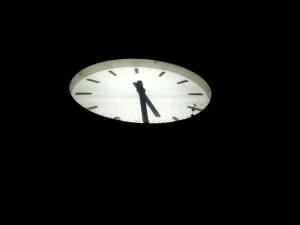 I did get a picture of the non-working clock on Centre Island though. At TBEX, there’s always another party and tonight (june 1) did not disappoint as I think it was Matador had a party at a local Club. With directions in hand and following a bunch of people off we went. More networking, but mostly partying. One blogger, Luke I believe (he was completely covered and I did not recognized his voice) even showed up in a morph suit, to the delight of the ladies with whom we were hanging out. On Sunday, I was late again, but I did catch the tail end of Erik Lindbergh’s (yup, related to the one and only Charles Lindbergh the trans-Atlantic flyer) talk about electric aviation. The aviation geek in me peaked, so I was excited about it. Sadly, Erik disappeared behind the curtains after his speech and thus I was unable to find him later to say hello. I’m following him on twitter though, so I’ve acknowledged liking his talk. I did attend a session by Ian Cleary about social media tools to increase your reach and then hopped around the next set of sessions, picking and choosing as I went. I thoroughly enjoyed Ian’s talk and did record it. So will work it out with Ian when/where to post it as its pretty long, but very informative. There was a talk by Matador that I wanted to attend, but was told by a guy at the door that it was now being held at a bar around the corner. Thinking it was a prank, I did not go; but apparently it was true. Not sure what happened there. Anyone know? After that I listened to Gary Arndt and the folks from This Week in Travel before heading out. Of course there was a final meet up at a place called Lou Dawg’s. The poor guy there had brought his computer so he could chill, not expecting about forty travel bloggers to descend on the place. He soon sent for backup after I told him what he was in for. Another great networking and just getting to know people and finding out what they are all about it. The next morning I had the 501 Tour so no rest for the weary at all. No worries, such is the life of a Travel Blogger. So if it sounds like I had way too much fun at TBEX, it’s ’cause I did. Now I have a ton of cards to go through and re-connect with people. If I met you, you’ll more than likely get an email soon or a tweet or some acknowledgement of our meeting. Following up after TBEX with the folks you met is very important, so ensure you do that. 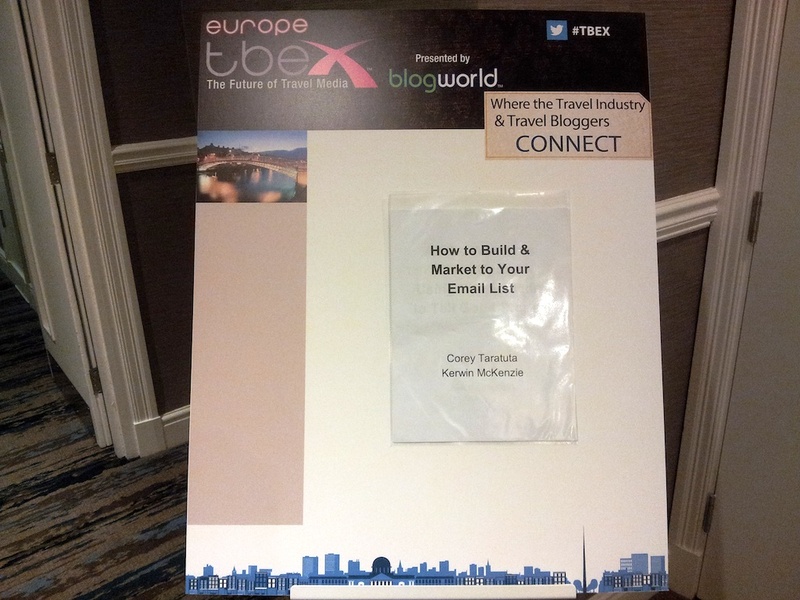 That was my TBEX, how was yours? Dublin anyone? As a travel blogger it is necessary for you to get your name out there. One of the best ways to do this is to visit conferences. These conferences do not always have to be travel-related ones. 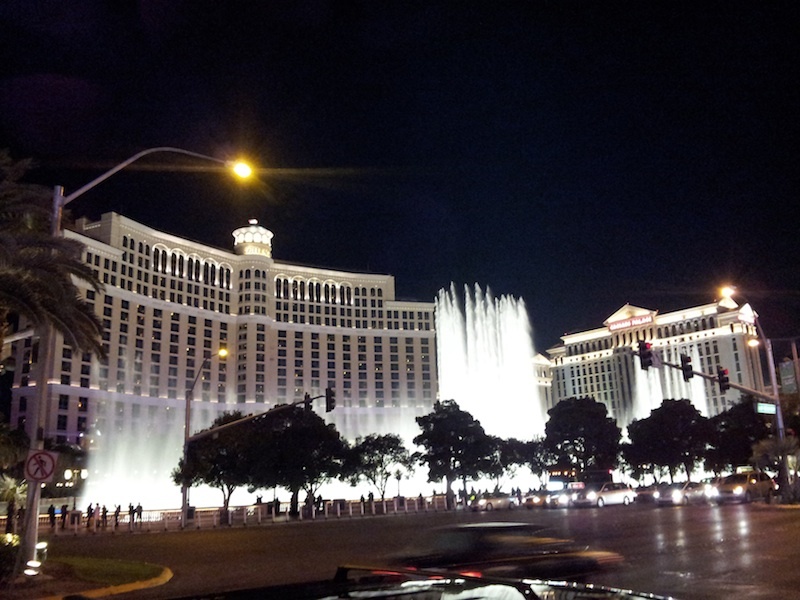 I’ve been visiting BlogWorld and CES (formerly Comdex) for a few years. 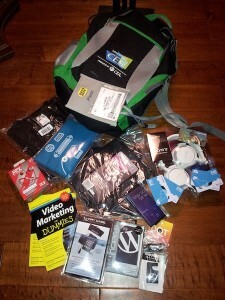 So when I had the opportunity to visit NMX, the New Media Exchange formerly BlogWorld (January 6-8, 2013) CES and the Consumer Electronics Show (formerly COMDEX) in Las Vegas this past week (January 8-11, 2013) I jumped at it. Online publications must also provide a monthly traffic report from an external demographic tool, like Google Analytics, verifying the site or blog gets 1,000 or more unique monthly visitors (UMVs). The Web publication must be a previously established, independent site that is regularly updated with original and current news-related content. YouTube sites, Twitter pages, personal blogs, forums, user groups and communities will not be considered for media registration. From CES – A backpack; you can’t buy these so its priceless, I’ll perhaps give it away as being a nomad, I have nowhere to store it. It served its purpose to bring the goodies to where I’m currently staying though. Oh and as Press, I got lunch each day, free WiFi in the Press Room as well as computers, if I needed them and I was able to interact with other journalist from around the world. Another item you cannot buy. From the Ford Booth – Sony MDR-V55 DJ Style Stereo Swivel Headphones with Reversible Earcups and Easy Portable Flexibility – White ($77.83). I went to the Ford booth as I wanted to talk to someone about a partnership and one of the marketing folks there told me about a contest; take a photo of yourself with any of the cards and add the hash tag #FordCES to it, tweet it and then show it to the folks there and if you are the first three you get a headset. So I did et voila, the Sony MDR-V55. Here’s my tweet. From MTX Audio – The iX2, a HiFi Quad Speaker Noise Isolation Headphones ($69.99). These are not yet available to the public. I wanted to get the headsets, the iX1 ($179.00), but they had no more available, so I settled for the earbuds. A review is eminent, but from what I heard from the headsets at the show, I’m already satisfied. 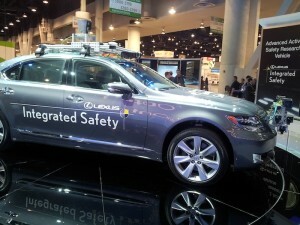 This is how they promoted it at CES; it worked, I talked to their Marketing guy and got onboard with the product. From Endgadget – A t-shirt obtained by participating in a tweet a code giveaway which unlocked a vending machine with the t-shirt ($15.00). From Wiley & Sons – Cocoon GRID-IT! Organizer Case (CPG7BK) ($14.99). Wiley & Sons was giving these away at their booth at NMX, just for showing up, so I snagged two of them. It’s an organizer for your bag so your stuff don’t go all over the place. From Wiley & Sons – Two copies of two chapters (2 & 19) of their Video Marketing For Dummies book ($16.49 for the complete book). While there I had a chance to meet Marsha Collier who writes for Wiley & Sons; I had Tech edited one of her books a few years back so it was extra special to finally meet her. I also got a chance to talk with Wiley & Sons about how they select topics and authors for their books. They have a acquisitions department that combs the web for experts for the topics they develop; then they contact them to see if they are interested in writing the book. So keep blogging about your passion. I got to talk to one of their representatives first hand about my talents. From Dry Case – The DryCASE Water-Proof Case for iPhone, iPod, Smartphones, and More (DC-13) ($39.99) ; a vacuum sealed case for your portable electronic device that’s not as large as an iPhone Mini. I came across these young guys while walking the floor. They were keen on demoing their product. I asked if I could get an evaluation copy; the sales guy was kind of hemming and hawing, but the Marketing guy stepped up gave me an evaluation copy. I tried it at the booth and it works as advertised; I was still able to use my phone, even took a picture and tweeted it. I think I messed up the twitter handle though; darn spell checker. 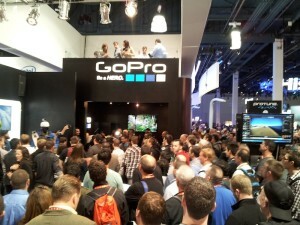 From GoPro – A t-shirt (caught it as they were throwing it out) and face-to-face time with a member of their PR Team; also will receive a $100 off coupon for the latest GoPro HD HERO3: Black Edition product. I currently have the original Hero, which I will keep to do multi-camera shoots. 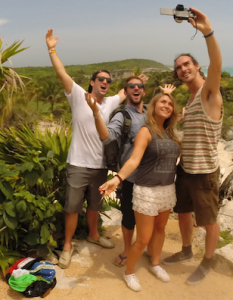 GoPro is pretty open to travel bloggers, so drop me a note and I’ll give you the details of the PR contact. When you contact them, give them a little time to respond as they are a bit overwhelmed with the public’s response. GoPro gave away three of their cameras as well as a bag of all their products; the crowd was wild and for good reason; the irony, my GoPro batteries were dead so I could not record it. From Lexus – a Lexus branded DOT for your phone. Works best on Apple devices; so a cool item for Apple device owners. From Lexus – a Lexus monogrammed cigarette lighter to USB converter ; I’ve wanted one of these for a while as most cars I rent (I don’t own a car), do not have one of these. I was actually going to purchase one myself. I had to say to the Lexus agent, “How did you know I wanted one of these?” He laughed. The PR contact for Toyota and Lexus – this will help me to find sponsors for the road part of my journey. From SurDoc – Four $100 gift cards ($400) – SurDoc is offering a 1 year unlimited cloud storage offer which expires at the end of February 2013. Then its like $20/year after that for three years. What a deal. From WordPress – An Incipio ultra thin iPhone 4/4S case case with the WordPress logo on the back. I don’t even have an iPhone, but they were giving these out at their booth at NMX and it will serve as a great gift for my readership. 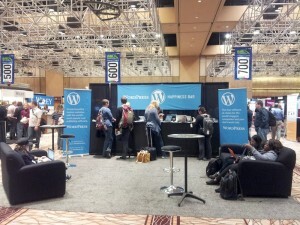 It’s always good to stop by the WordPress booths at these conferences, as the geniuses at the Happiness Bar are there with one purpose in mind; to help you with your WordPress issues. Guess what, its totally FREE. Now all this merchandise although FREE, as you know and I’ve said above it is necessary to review them on my different properties (www.cruisinaltitude.com, www.passrider.com, www.upgradeyourtrips.com, www.cookingwithkerwin.com and of course this site) as appropriate. So once reviewed, I will give them away to my readership as prizes or use them for my own; more than likely the headset :-). The message here is to get out there, look for other conferences other than travel conferences and find things that will appeal to your readers as you visit the conferences. What are you waiting for go do it! Are there any other non-travel conferences you would recommend? Please share by leaving a comment below. Also, please share this post with your fellow travel bloggers.